Our electric asisst helps tremendously in the hilly areas. Electric motor istalled as a part of the transfer hub poweres up rear differential and the power is transmitted on both rear wheels. With a gearing ratio it increases the torque of the motor. There is no better way of placing the drive system. The electric asisst can be used on cargo bikes, base trike with flatbed pedicabs and rickshaws. Ideal solution for those who are thinking about electrifying their trike in the near future. 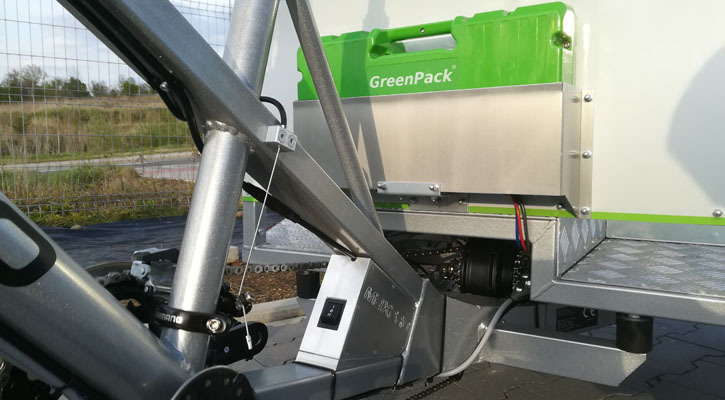 The system comes with all electric assist drive fitted and it's integrated for GreenPack battery which can be added at any time in the future to a ready GreenPack pocket. You can buy or rent GreenPack battery at any time. The best value and most recommended solution for a professional users. Comes with a fully fitted Dapu motor, LCD controller and the advanced quality battery from GreenPack which allows for range up to 100km. It's more then enough to have a daily shift. Seems expensive but for a 1400Wh battery packs loaded with quality Samsung cells it's a best value power drive system you can get.